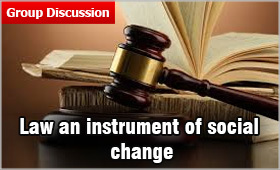 The recent debate on various customs and practices prevailing in the society look upon the Law as an instrument of social change. There are many customs in a society especially in our part of the world which are discriminatory and always play a part in oppressing the weaker sections of the society. The debate and discussion in different quarters have also reached the B-schools who have included this topic in their Group Discussion round in final admission process. There always arises a need to reform the society so that it keeps track with the fast changing world. The courts of law can play a powerful role in making the society more tolerant and adjusting towards the people who always remain at its margins. Why should the women be left on their own by uttering triple Talaq? How can women feel safe while going places in odd hours? How Law could bring awareness on the issues on environment for the benefit of future generation. All this can be done by not only passing an Act but also making it penetrate into the social system as happened in past also. Any judicial proceeding in connection with the dispensation of justice to activate the instrument of Judicial Process in setting right the wrong done or eliminating injustice from the society is regarded as ‘Judicial Process for social ordering’. In many cases judicial process or law have acted as a means of social change. Justice P. N. Bhagwati and Justice V. R. Krishna Iyer, both were of the opinion that law is an instrument of social change, social justice and social ordering. Deprivation of the fundamental rights often results into social disorder. Article 32 is an important instrument of judicial process to enforce social ordering which empowers the Supreme Court to issue directions or orders or writs for enforcement of any right conferred under the Constitution for securing social justice. The Supreme Court is a sentinel of all fundamental rights. In every area of social disorder the apex court has taken recourse of judicial process effectively in every area of social disorder thus granting great relief in cases of social injustice to the affected groups of the society under this provision. This important article of the Indian constitution has accorded free hand to the Supreme Court to take suitable action for the enforcement of social order. Article 32 empowers the Supreme Court while Article 226 empowers the High Courts to issue writs against any authority of the State in order to enforce the Fundamental rights. Using the above mentioned provision the Supreme Court of India has many a times acted to safeguard the social justice and rights of the citizens and has come out with remarkable judgements in providing justice in cases related to the backward class of the society, Bigamy, Bride Burning, issues of Bonded Labour, Caste System, Child labour, Child prostitution, Dowry death, Female Foeticide, harassment of women, crime against women, and immoral trafficking. Justice Rangnath Mishra, former Chief Justice of India had observed that 'Law is a means to an end and justice is the end’. Law cannot be effective if it does not take the recourse of judicial process. Judiciary plays a remarkable role in making the society safer for the people and ensures social order. In a society as diverse as India Judiciary has indeed played a big role in trying to maintain the social balance by providing justice and rights to the people who are living at the margins of our society. In fact when every hope is lost it’s the judiciary only which comes to the rescue of down trodden and disposed class.